Due to the wide range of elevations in Copper Canyon country (up to 1500 meters [5000 feet] of altitude difference), there is a wide variety of weather and climatic conditions. In general, the canyon bottoms will be up to 10+ degrees Celsius (~20 degrees Fahrenheit) warmer or hotter than the rim. For example, in the summer when the temperature at the rim at Creel can be warm, the temperatures In the canyon bottom (such as Batopilas or Urique) can be very hot (up to 40 degrees Celsius or 100 degrees Fahrenheit). In general, the canyon rims where most visitors will want to will have a moderate climate similar to areas of equivalent altitude in the Southwestern U.S. (New Mexico and Arizona) or southern Europe. Summer months will be warm to hot (30 Celsius or 85 Fahrenheit. Spring and fall will be pleasant at 15 to 20 degrees Celsius (60 to 70 Fahrenheit, and winters can occasionally be cold. Freezing temperatures are occasionally experienced at night from December to February while days typically warm above freezing. The Copper Canyon region of Mexico experiences a summer rain pattern. That is, it rains frequently between the months of June and August with lesser amounts in May and September. Often these rains will be intense but brief, a pattern sometimes called “tropical monsoon.” As a result of this atmospheric moisture in summer, the canyon bottoms can be very humid in addition to high temperature. In other times of year, precipitation (rain or snow) is infrequent. Most visitors find that the weather is best for visiting the Copper Canyon in the spring, summer, or autumn. The winter is too cold for many. For more information about Copper Canyon weather and when to visit, click below or search the Internet. The safety and security of visitors to Copper Canyon country is an issue for many people thinking about enjoying the region’s attractions. Over the years there have been many media stories about violence and crime in Mexico. Many of these incidents are based on conflicts over drugs and the “cartels” that participate in drugs. Other stories deal with less serious crimes such as pick-pocketing or robberies in Mexico’s cities where visitors are victimized while seeing the country’s well-known tourist sites. Fortunately, the Copper Canyon region is very far from the drug or urban areas that generate the vast majority of such stories. It is 260 kilometers (160 miles) from Chihuahua, the nearest large city, and another 240 kilometers (150 miles) to the closest border station with the US (Ojinaga) where drugs are more common. While transportation for tourists is good, criminals do not have fast and easy access to the area. As stated by the U.S. Department of State in its 2015 travel advisory for Mexico, “Resort areas and tourist destinations in Mexico generally do not see the levels of drug-related violence and crime that are reported in the border region or in areas along major trafficking routes.” (Dated May 5, 2015). There are other reasons why Copper Canyon is seen as safe for visitors. As a rural area surrounded by forests and nature where people live a more traditional way of life, the region is free from many of the social problems in the crowded cities or border areas. In addition, as a tourist area, there is strong concern by law enforcement and other government agencies and local businesses to maintain a safe environment. More importantly, local people recognize that a safety and security are important to maintain the health of tourism and help to control criminal activity. For more information about crime and safety in Mexico , click below or search the Internet. 1. Tell someone (at your hotel, outfitter, or tourist office) of your general plans for traveling or hiking (where and when you will go). Copper Canyon country is large. Not many people live there. If an emergency should arise, then the authorities or rescue parties can know where to look for you. 2. Seek advice from local residents if there are any areas or times where there might be a crime concern. 3. Be friendly and open with local residents – whether Tarahumara or other - you may meet on the Camino. Don’t approach them with a threatening or suspicious manner. In most cases they will be just as friendly and open in return. The Camino del Cobre is designed for all types of visitors: those who are comfortable with hiking on their own, as well those who prefer to use the services of guides or outfitters who can assist in the logistics of hiking in the outdoors of Copper Canyon (food, tents, etc.). These companies may also be able to provide transportation to hiking locations or simply knowledgeable advice on hiking opportunities. As a developed tourist area, Creel offers a number of experienced and well-qualified outfitters. They offer a wide variety of services and recreation opportunities, including hiking, mountain biking, adventuring, or simple sightseeing coach tours. For a list compiled by a well-known newspaper, click below. Or search the Internet. In many cases these companies may be contacted via the Internet, making it unnecessary to come to Creel to arrange for their services. The Camino region is a rugged and relatively less explored area. The detail trail and topographic maps often purchased for use in other countries are not available. However, for an overall perspective, hikers may want to buy a topographic and road map of the area south of Creel. It omits the final 2 kilometers into Creel itself but provides valuable information for the remaining 95% of the Camino . The map is a product of the Mexican geographical service called INEGI (for its initials in Spanish). The section depicted is titled San Jose de Guacayvo with the ID number G13A21. The map is good for giving an overview of the relief of the area (arroyos, summits, and the like). However, its information about trails, roads, power lines, and houses is in many cases out of date or unreliable. It is for sale in various shops in Creel. The Camino is indicated by simple green and red trail markers roughly 5 X 10 centimeters (2 X 4 inches) painted primarily on trees or rocks. The markers are generally horizontal bars. In certain situations the markers are also found on telephone poles, fence posts, concrete walls, buildings, even the concrete ties of the railroad – anywhere they are easily visible and helpful to the hiker who doesn’t know the route. The markers are generally 30 - 40 meters apart. In cases where the trail is difficult to follow, or very important, the markers are more frequent – sometimes as close as 5 meters or less. On some paths that are easy to follow (for example, a long straight road with no intersecting paths), the markers are farther apart. Their purpose is primarily to provide reassurance that the hiker is indeed on the correct path. From one marker it should be possible to see the next marker along the trail. If not immediately visible, hikers should walk forward following their previous direction (e.g., straight) while looking for the next marker on nearby trees or rocks. It should be visible within 15 meters. In addition to the principal markers showing the correct path, the Camino also shows a large red “X” on trails that are NOT correct. These are typically found at intersections where there might be some uncertainty about which path to take. Moreover, to show where there are turns or gentler “bends” in the path, the trail markers show the oncoming turn, either sharply or in a gradual “Y” curve. Every day the train makes a 650 kilometer (400 mile) journey between Chihuahua City and Los Mochis on the Mexican Pacific coast. In its western half the journey travels right through the Copper Canyon country (including the Barranca del Cobre itself). It makes a special stop to view the Barranca at Divisadero and another stop at the tourist center of Creel (45 kilometers, or 25 miles away). Passengers have the choice of two different classes of service. 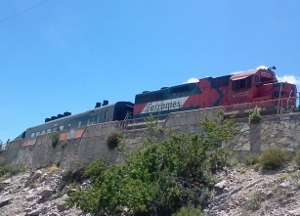 While there is an economical service oriented toward local residents, many of the passengers on the Chepe train are tourists, both Mexican and foreign. Because the Camino del Cobre starts right at the train station in Creel, it may be a good transportation option for Camino hikers. For more detailed information about the Chepe, fares, time schedules, stops, and reservations, click below, or search the Internet. The Camino is for hikers who want to enjoy walking outdoors. However, in practical terms, many hikers may want to spend some portion of a day hiking and the rest of the day at some other recreational activity. Therefore, the Camino is designed to be experienced in discrete, and somewhat independent, segments (similar to Trails in other countries). At convenient points along the Camino the hiker can leave the trail, walk ~50 meters to a junction with Highway 77, and return to Creel via some form of motor transportation. Alternatively, the hiker may take a vehicle from Creel to an access point, and return to town walking on the Camino. The most convenient vehicle transport is with one of the many transportation companies in Creel. In many cases it is possible to arrange direct transport either to or from an access point for a reasonable cost. Alternatively, some hikers may prefer to use buses. Bus transportation is a very common throughout Mexico. The Creel and entire Barrancas region has a well-developed system of bus transportation. There are many buses that regularly travel along the main Creel-to-Divisadero highway. Using buses for some portion of a day’s hiking is feasible. There are 3 leading bus companies that serve the highway: Rápidos Cauhtémoc,,its affiliate Transportes Chihuahuenses, and Noroeste. Their offices and departure points are located in Creel on the same road as the train station (on the west side of the tracks). Between Creel and San Rafael (a village just south of Divisadero) their official stops along the highway are in the pueblos of Santa Elena, San Elias, and Pitorreal. In several locations there are also permanent bus stop structures along the highway such as at the rancho of Nacayvo. However, as is common in Mexico, bus drivers will stop and let passengers off anywhere on the route they want (subject to a safe and convenient location). Similarly, bus drivers will stop to pick up passengers who “flag them down” anywhere on the highway (also in safe locations). Bus costs from Creel (2015) range from 20 pesos (the pueblos closest to Creel) to 50 pesos (Divisadero).